Glory Blogs | Why you Should not start blogging Today? Blogging isn’t for everyone and we will go over five reasons why you should not start a blog. I'm going to tell you what no one else will tell you. Don't Start A Blog If You Love Your Day Job! Blogging is a home based business that can be started with very little upfront costs and monetized relatively quickly. Having reviewed and tried multiple home based businesses I’ve found blogging to be the most cost-effective side hustle you can ramp up into a full-time income in six months to a year! There is no inventory to buy or keep, costs of starting a blog are minimal and there is almost no overhead plus it can be run remotely and on your own schedule. In fact you can blog from home at any time of day or night and still make money! Reason #1 You like having a boss, job, commute and limited vacation days. Blogging isn’t for you if you like having a boss, job, commute and limited vacation days. Do you like someone telling you when you can take your lunch break? I personally can’t think of anything worse than working for someone else. But, perhaps you like your boss and think all his jokes are funny – NOT! Maybe you don’t mind grinding 9-5 day in and day out. Or maybe you love your commute. Perhaps you hate time off. Honestly, I just cannot relate. But if you enjoy having a boss, job, commute and limited vacation days then you probably wouldn’t like blogging. I love blogging because I’m my own boss, my commute takes all of two minutes and I can work in a bikini, cowboy hat (from the dollar store thank you!) and flip-flops if I like! Blogging gives me freedom! Autonomy! I don't have to answer to anyone but myself. Taking calls in my pajamas – yes! Working from the beach today? Double yes! Taking a last-minute trip? Triple yes! Reason # 2 Because you think it’s a get rich quick thing and if it isn’t you’re ghosting on the whole idea. Blogging won’t work for you if you think it’s something you can just throw together and become an overnight success with millions flowing into your bank account with no effort to show for it. It just does not work that way. Most people give up on their blogs after a few months when their success is just around the next corner. You have to be willing to give it a solid six to eight months before you make a dime, longer if you change your blog name or niche or ‘start over.' I monetized sooner than that but that's what you should be willing to do so you can manage your mindset. That way any money that comes in sooner feels like a bonus. I gave myself eight months and my goal was to make at least $1 within those eight months. It didn't take me that long and I've made WAY more than that since I launched my blog but I was ready to put in those eight months regardless. You should probably think of it more like a baby. Your blog has to be nurtured and coddled and cared for and ‘raised' until it can walk. Ghosting on your blog will just not get you the income you're seeking from blogging. Reason #3 Because it works for everyone else except you – and it really doesn’t work for anyone else either! Blogging does work. It works for a lot of people. Women and men can succeed at blogging. But it does take work. The right classes can help you save yourself some time and make money faster. For example, I’ve been able to monetize my blog using affiliate links. And you can too. Within eight weeks of taking her course I had made my first affiliate sale of $65 and it that's just the beginning. And if you don't believe me look at any of Michelle Schroder-Gardner's income reports. She consistently makes over $100,000 per month and half of that is usually from affiliate sales. Affiliate sales is one of the best things that can let you make money even when you’re sleeping, all you have to do is put a link for products/services you think might be helpful for other people, sales will run on the run, you don’t have to take care for sales but rather the content in your blog because that’s what will bring you more visitors hence more sales. Maybe you would rather trade time for money or trade your life for a paycheck. I would prefer things the other way around. I also love it when people I don’t even know in another city or even another country find my posts valuable and I’ve helped make someone else’s life better because I published online. How awesome is that? Super awesome! I love waking up to the kinds of emails where I made money in my sleep. But maybe you don't. And this one is where I will have to admit I waiver. Having a paycheck is nice. I do miss the regularity of the steady paycheck. So perhaps doing the paycheck thing is ok as long as you’ve got a great side hustle in the works (like a blog!) that will someday take over and put you onto the ‘potential for unlimited income' track. Working for yourself may not feel like it has the same security as a job. But judging by how quickly one can be let go from the best of jobs, there is no longer any such thing as job security anymore. Blogging is definitely not for everyone so you definitely want to be clear about your reasons and goals for starting a blog. You also want to be realistic about the time and work involved and how that compares to other forms of income. At the same time you'll want to keep in mind that almost anyone can succeed at blogging with a little time, effort and the right tools. Without the potential of a future better than a 9-5 paycheck to paycheck life with a boss, limited vacation days and very little autonomy, having just a job is just a tradeoff that doesn’t feel worth it to me. I can't imagine anyone settling for that yet many do. I believe in blogging. I still think it’s the lowest cost home based business you can run remotely whether you have a day job or not. Once it monetizes you can grow it and work towards replacing your income so you can jettison that job and work for yourself full-time. I’m so grateful I found blogging when I did! Starting a blog only takes a few minutes.Start your blog like I did on SmarterAsp.net today! With the purchase of a one year plan I'll throw in your domain name for free and setting up your blog only takes a few minutes! Was this helpful? What other topics can I cover on this blog to help you on your work from home or blogging journey? 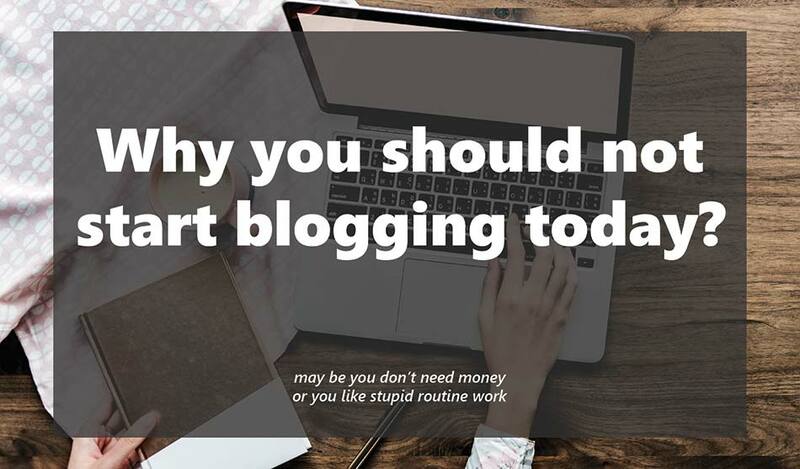 I hope I've made you realize all the great reasons to start your blog today! Do you think you would rather work 9-5 or start a blog? *This post may contain affiliate links which means if you click a link on this page and make a purchase we may receive a commission at no additional cost to you. We only recommend products we use and love. Thank you for supporting our blog! Our polices page can be found here.